C-Line 8 Tab Clear Polypropylene Sheet Protectors are top loading polypropylene sheet protector and index all in one. It is constructed from the polypropylene material that offers no copy transfer, acid-free and permanent storage. The heavyweight material offers extra durability for permanent storage of frequently used materials. The sheet protectors with built-in index tabs are an excellent way for anybody to organize. A clear protector finish offers a sharp, transparent finish. It's the perfect for showcasing your materials and make presentation appear bold and bright. You're certain to find a sheet protector that meets your needs, no matter what job you're trying to accomplish. C-Line's sheet protectors are available in a variety of materials and finishes and are designed to protect your documents day after day, no matter how often they're handled. Remember, with all C-Line's top loading sheet protectors-no sheet punching is necessary. 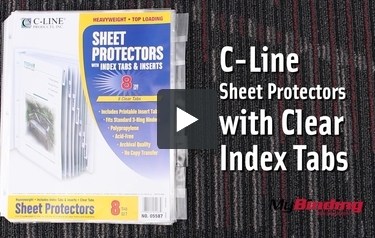 Transcript: This is the C-Line Sheet Protectors with Clear Index Tabs! It’s a clear sheet protector with index tabs on the side. It comes with printable tabs sheet with instructions right on how to use it in your printer. Now with a little skill you can slip in a sheet or two of 8.5 x 11 paper to protect and further organize your sheets. They work nicely in a three ring binder, though in a standard binder they will hang out the edge. To avoid this use an extra wide binder, this way your tabs are fully protected. These are great to organize your binder will using other sheet protectors! This is the C-Line Sheet Protectors with Clear Index Tabs! And you can slip in the labels in like so—this one I simply wrote on. Here you can see a look at the seems and the clear plastic material.